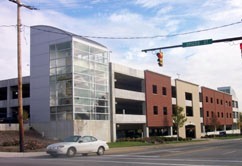 Kenmore Companies was hired by the University of Akron to provide construction management services for a new parking garage on campus. This facility accommodates 1100 vehicles and incorporates a brick façade and other architectural features that create a centerpiece for the eastern gateway of The University. The construction of the deck utilized post tensioning in the concrete to keep the project budget to a minimum. Structural issues discovered early in the project and required time for redesign. This dictated the development of a recovery schedule in order to deliver the project in time for the fall semester of 2001. The project was completed for the fall semester at a cost of $12 Million.